Tiny houses are popping up all around campus to meet the sustainability needs of university community members. The recycle houses, as they’ve been dubbed, are 4 feet tall and 2 feet wide with three compartments dedicated to small electronics, food donations and plastics. The goal of the recycle depository’s construction was to be simple and effective. Food donations collected benefit the FIU Food Pantry. Electronics and batteries are harvested by a local recycler. And plastic bags are recycled. Janet Branch, FIU’s Housing Facilities manager, designed the houses in partnership with the Office of Sustainability. Branch was inspired after working with Residential Life, which oversees residential housing on campus, on several collection drives. They would place cardboard boxes throughout the lobbies of the residential halls to collect donations. Branch saw room for improvement. She set out to recreate the donation box into something eye catching and direct. “Typically, items were collected in decorated cardboard boxes, and often created an eyesore in our lobbies,” she says. “It was my desire to create a collection point for the students to use that looked intentional and attractive. Branch worked with recycle bin vendors Max R to turn her vision into reality. “With the help of the Office of Sustainability, we then identified the key items going to landfills causing the largest problem,” she says. Plastic bags, electronics and batteries were the main offenders. The demand and ability to recycle them is constantly changing. 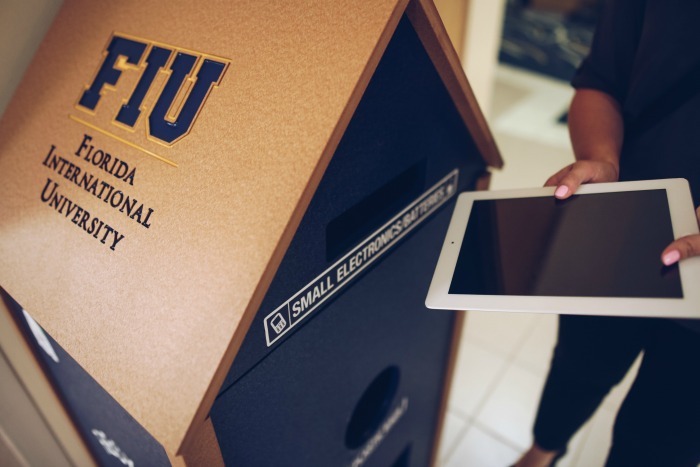 So each recycle house is accompanied by a poster that provides the FIU community with directions on what can be recycled. In addition, each compartment is labeled with vinyl stickers that can easily be switched out to meet new demands or special drives. Currently, there are five recycle houses around Modesto A. Maidique Campus (GC, Office of Sustainability, Parkview, Panther Hall and University Apartments). 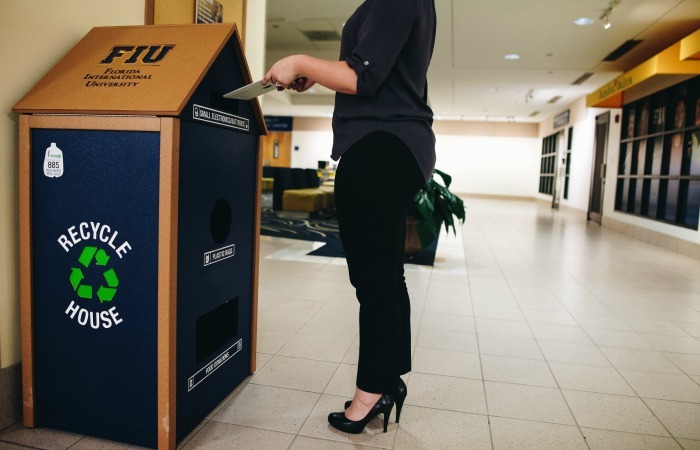 Branch expects the bins to be located within every residential hall by this fall, and eventually in every FIU building. Wow, what a great new movement! Great article!